It doesn’t happen very often that while hunting the prey appears on its own and sets itself on the exact spot where the hunter wants it. That’s why many hunters use different techniques and accessories to attract the animal they’re hunting. In this article, we’ll focus on different techniques, tips and tricks on how to call a deer that are used by hunters all around the world to get the deer into the perfect position and within shooting range. 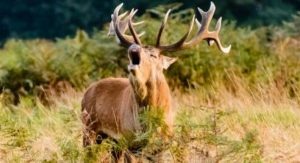 There’s much more to it than one might think and know the details explained in this article is what can help you make your deer-calling much more effective. One of the most important tip to always keep in mind is to choose the place from which you’ll be calling wisely. The idea is that the deer don’t see the place where the call is coming from clearly so that they move closer to check out what the source of the call is. If they see beforehand that there’s no deer, they’ll feel no need to check it, and just walk away. Basically, by the time the deer figures out that there’s no animal making the call, it should already be in shooting range. Another important aspect to take into consideration once choosing the place from which you’ll be calling is the direction of the wind. If there’s the slightest chance that due to the wind’s direction the deer you’re trying to attract might catch on your scent, your efforts will, more often than not, not give you the results you’re looking for. So based on the wind, you might want to consider finding the highest possible point. Not all techniques and calls work the same at all times. What works in early October (pre-rut) will most likely not work in December (post-rut). This goes especially for grunts because depending on rut phase, you’re going to want to communicate with either does or bucks accordingly. A certain type of call, let’s say a doe grunt, won’t always work to attract a buck, no matter how genuine and real it sounds. Also, depending on the rut phase, you might not want to communicate with your final prey. What I mean by this is that during the peak of the rut, it can be quite challenging to get the buck to ignore the does and follow your calls, no matter which ones you use, so it might be more effective to try and attract a doe instead, and let it guides the buck to you. There are a lot of charts on the internet that provides information on when to use which call (for example, this one), but rather than considering them absolutely correct, it would be better to take them merely as guidelines, something to get you started. Especially if every time you go hunting you tend to go to the same area, you’ll soon see that nothing beats a hunter’s instinct. After a while, you’ll be able to make your own judgment about which call to use to attract exactly the type of deer you want. Believe it or not, the time of day is also very important. For example, at the beginning of the hunting season in the morning a basic grunt will most likely attract does, while in the evening there’s a bigger chance of it attracting bucks. This has to do with the animal’s daily routine, in the morning or early in the day does group-up and communicate, so they’re more attentive to all the sounds, including your grunt. However, if it’s a buck you’re after, the grant will give more results in the evening because it’s when the bucks are meeting in bachelor’s groups and doing soft sparring to establish dominance, so they’re looking for each other which you can use to your advantage. Understanding the difference between the types and being able to reproduce them as natural-sounding is possible is very important. Vocal communication is very diverse when it comes to deer, and the same way not all calls and grunts work at all moments of the season, different types of grunts will get you different results. Each type of grunt has its own characteristics, in terms of volume, frequency, tone, how long it should last, etc., and each also communicates something different. For example, a doe grunt should be soft, short and with 15-20 second pauses between each. Think of it as a way of greeting and inviting to come closer. On the other hand, the snort-wheeze is aggressive sound bucks produce to make other bucks aware of their presence and to challenge their dominance. If the bucks around are not sky (yes, there is such a thing as a shy buck), they will walk closer to the source of the call to set things straight and establish their dominance. Rattling is a great technique if you’re hunting a buck. It can be produced either by using horns and rattling them together, but you can achieve the same results by using a rattling bag. The reason why it’s a very popular technique is that it imitates the same sound that is produced when bucks spar. Again, depending on the rut phase, your rattling should be more or less aggressive. If in the pre-rut, it can be very soft, while during the peak of the rut, it should be more aggressive, it’s when bucks fight for the does. Some grunts can be produced by the hunter. For example, a fawn grunt or the snort wheeze are not very complicated sounds and a person can train the vocal cords to produce it. However, there are others that can be more of a challenge, and in order to be able to use those as well, the so-called deer grunt-calls are available for the hunters to purchase and use in different situations. Many of them are adjustable, so more than one type of grunt can be produced using it. Learning different techniques and trick to call a deer is definitely something worth investing your time in, as it can dramatically increase your chances of getting the hunting result you’re after. Knowing which grunt to use and when, when and how to rattle, how to set up your position, will help you attract a specific type of prey to make your hunting trips challenging and also educational at the same time. The tips mentioned in this articles are the basics you should be aware of, but, as you’ll soon notice, no amount of reading and practicing at home compares to actually going out and trying different techniques, and learning about deer behavior by observing the animals and their reactions. As always, practice makes perfect and trying out these tips you’ll come to develop your own style and preferred combinations, making your hunting technique (the combination of your preferred bow, type of hunting and deer calling) unique and exciting.